The answer most assuredly is not owing to a cornucopia of earnings. In fact, on an inflation-adjusted basis, real earnings growth has been just as punk as industrial production. Thus, at the goldilocks peak back in 2007, S&P earnings in present day dollars amounted to $99 per share. 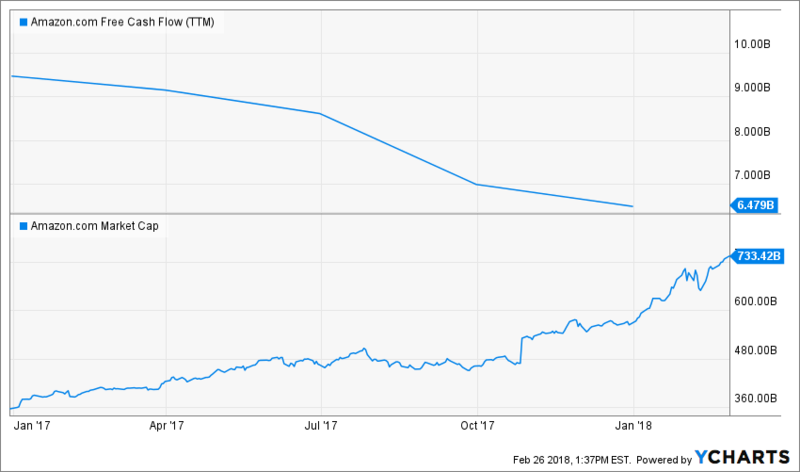 During the most recent LTM period (December 2017), they posted at $106.84 per share—thereby representing a mere8% gain over the course of the entire last decade. We’d say that a 58% gain in stock prices against a 8% gain in real earnings and 2% gain in real production couldn’t happen in a million years on the honest free market. And most especially not when the numbers are adjusted for inflation and when they traverse a complete peak-to-peak business cycle. So what we have is a monumental and unprecedented decoupling of financial asset prices from the real main street economy. Nor is the cause of that dangerous divergence hard to identify. The fact is, the massive monetary stimulus since the great financial crisis never really left the canyons of Wall Street. In combination, ultra-cheap debt and the price-keeping operations of the Fed and other central banks fostered an outbreak of speculation, financial engineering and pure wagering (e.g. short selling “vol”) that has no precedent. And that includes the dotcom peak in March 2000. Most of the real crazy stuff back then was comparative small fry on a market cap basis. For instance, Pets. com had a peak market cap of just$400 million before it perished. By contrast, here’s crazy: Amazon’s (AMZN) market cap has now hit $734 billion, where it trades at 246X LTM earnings and 115X operating free cash flow. Now nearing its 30th birthday, AMZN is surely no rocket-ship start-up—nor even a modest grower of profits. To wit, its operating free cash flow in 2017 was a paltry $6.5 billion, representing the net from $18.5 billion of operating cash flow and $12.0 billion in CapEx. By contrast, in 2016 it cash from operations was nearly the same at $17.3 billion, while CapEx was substantially lower at $7.8 billion. Accordingly, the arithmetic tells you all you need to know. 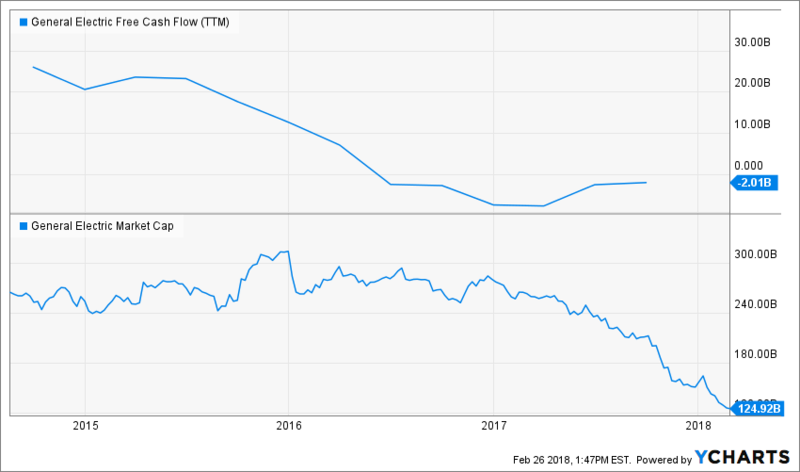 Amazon’s free cash flow during 2016 was $9.5 billion, meaning that during the last 12 months its market cap has soared by $375 billion or 103%—-even as its free cash flow has declined by 32%. There’s your poster child for 11th hour mania, if there ever was one. The raging algo-machines and day traders of the casino have apparently determined to reward a $3 billion plunge in free cash flow with a $375 billion gain in valuation. Our point here, however, is not merely that Jeff Bezos and his camp followers are not nearly as rich as they think they are or that hundreds of billions of AMZN market cap is destined to be ionized when this hideous Wall Street bubble finally collapses. Nor is it that Amazon is some kind of freak outlier. In fact, the utterly stupid valuation it has now attained is merely symptomatic of a central bank-ruined stock market that is incapable of pricing anything correctly, and in a manner that is even remotely consistent with the flat-lining trends on main street. In that regard, consider the pitiful inability of Wall Street to figure out that GE was a long-running house of financial engineering cards—going all the way back to the era of Jack (“earnings-to-the-penny”)Welch. Or, for that matter, that his successor, and also Barry’s chief advisor on creating jobs in America, Jeffrey Immelt, was burning cash on financial engineering like there was no tomorrow in a desperate bid to keep GE’s stock price alive and his options in the money. We do not exaggerate. During the five years ending in December 2017, GE paid out $41 billion in dividends and $35.5 billion in stock buybacks. Yet in pumping nearly $77 billion back into the casino, it was voraciously eating its seed corn via serial divestitures and the fact that it generated only $46 billion in operating free cash flow. Still, the robo-machines and punters did not espy its rapidly shrinking free cash flow until it had plunged from $28 billion in mid-2014 into negative territory two years ago; only then did GE’s market cap begin a devastating slide from $300 billion to $125 billion (and still sinking). Needless to say, GE is not the only company that is eating its seed corn. That’s the whole motif of Bubble Finance. That’s what C-suites do when they are incentivized by central bank fueled speculation and asset price falsification to cycle their cash flow and balance sheet capacity into financial engineering maneuvers, not long-term investments in productive assets and growth strategies. That’s also why the Trump/GOP deficit-financed corporate rate cut was so utterly misguided. As we insisted at the time, the overwhelming share of the after-tax gain would go into stock buybacks and dividends, not productive investments on main street. 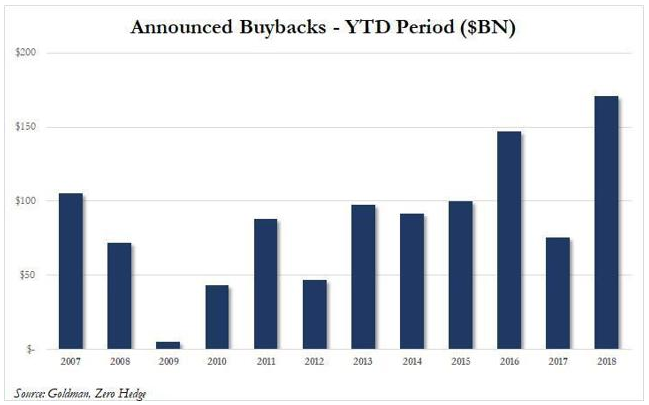 And with a record $171 billion of share buybacks announced during the first two months of 2018, the proof is in the pudding. At this rate, the S&P 500 companies would hit an insane annual stock buyback rate of $1 trillion. That compares to already swollen levels of $500-$600 billion in recent years. To be sure, we don’t believe they will ever get there because the bond “yield shock” is going to be sobering up corporate boards right soon. 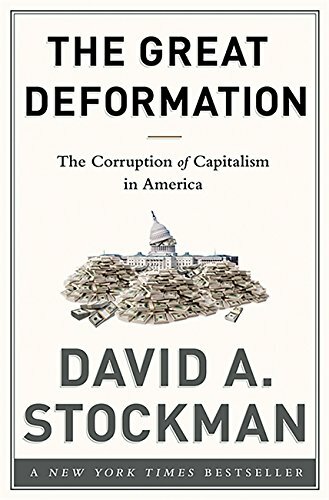 Still, even this possibility is a reminder that the massive explosion of stock buybacks, M&A deals and other forms of corporate financial engineering ($15 trillion since 2006) is part and parcel of the central bank driven deformation that underlies the radical decoupling of Wall Street from the main street economy. Moreover, that decoupling cut both ways. That is, it involved both the massive inflation of financial asset values and a simultaneous deflation of main street’s growth capacity. For example, Amazon’s rampant predatory pricing into sector after sector is not the free market at work, nor does it embody inventive genius or Schumpeter’s “creative destruction”. To the contrary, Amazon is a giant vehicle of “destructive destruction” pure and simple. It’s hideous market cap at $735 billion and lunatic valuation multiples are what cause its predatory pricing. That is, at 25X operating free cash flow, Jeff Bezos would be worth $20 billion, not $125 billion. 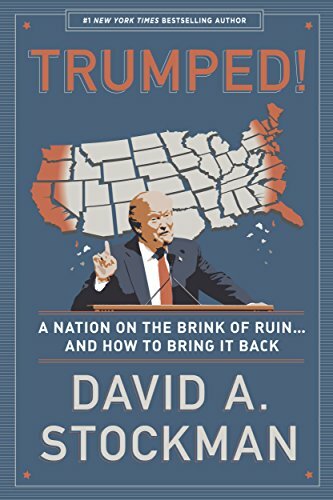 Accordingly, we’d bet his pricing strategy would be considerably more rational, and that Amazon would not have destroyed tens of billions of otherwise productive assets in the malls and other venues it has obliterated. Needless to say, Amazon’s preposterous Wall Street valuation and resulting predation on main street is just one of the ways in which Bubble Finance is injuring the real economy. The trillions of pointless M&A deals enabled by cheap debt and the consequent phony “accretion” to earnings is another fish of the same kettle. In pursuit of impossible to achieve “synergies”, serial takeover artists have simply obliterated jobs and the ingredients of future growth (i.e. R&D, staff training and development, marketing etc) to appease Wall Street speculators. When, alas, said synergies fail to appear or get lost in the passage of time, the resulting billions of good will and assets are written off and excluded from “adjusted earnings” (i.e. ex-items) on the grounds that they are non-recurring! So we’d bet that absent the Fed’s baleful regime of Bubble Finance, real net investment in plant and equipment would not have plunged by 35% from its turn of the century levels. That brings us back to the industrial production report for January. When you dig below the headline print, which was bad enough, there lurks even more compelling evidence that the main street economy has not “recovered”. Thus, total manufacturing output still stands 2.3% below its level of a decade ago at the November 2007 pre-crisis peak! Moreover, after the four-year rebound from the deep recession bottom of June 2009, expansion has slowed to a crawl. The 5-year growth rate since January 2013 has been a meager 0.97% per annum. So we think barring some unforeseen economic miracle, the top for this cycle will actually end uplower then the last one, and that’s something altogether new under the sun. It would be no exaggeration to say that it would mark the end of economic growth as we have known it. In the meanwhile, another question recurs. Why does the Fed and Wall Street keep calling this a recovery? The chart below makes clear what historical recoveries have looked like. During the nine-year expansion between the June 1981 pre-recession peak and that of June 1990, manufacturing output expanded at 2.8% per annum. During the tech boom of the 1990s expansion, the rate was even stronger at 4.7% per annum. Even the seven-year expansion propelled by the Greenspan housing boom between June 2000 and November 2007 generated a 1.7% per annum growth rate. Yet 10-years out from the last peak, and with manufacturing output still 2.3% below the starting point, the boys and girls on Wall Street dare not ask the perennial question: Are we there yet? Actually, when you dig beneath the surface, the whole idea of an industrial recovery becomes just plain ludicrous. 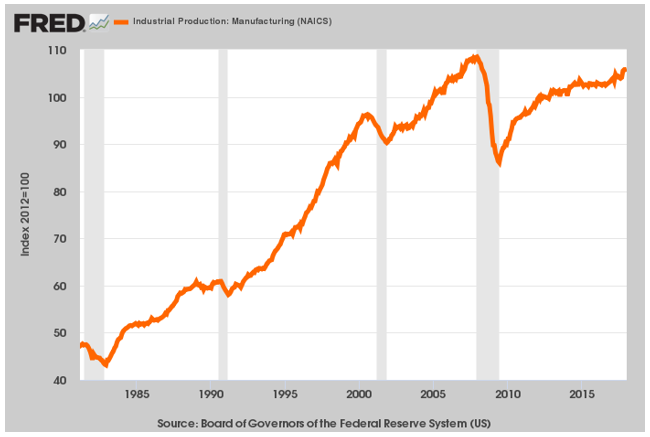 The chart below tracks the last three business cycles for three major components of manufacturing production, and in that context it is obvious that there has been no recovery at all. Thus, business equipment expanded by 3.5% per annum during the 1980s peak-to-peak cycle (June 1981 to June 1990) and then by a 7.0% rate during the 1990s expansion. 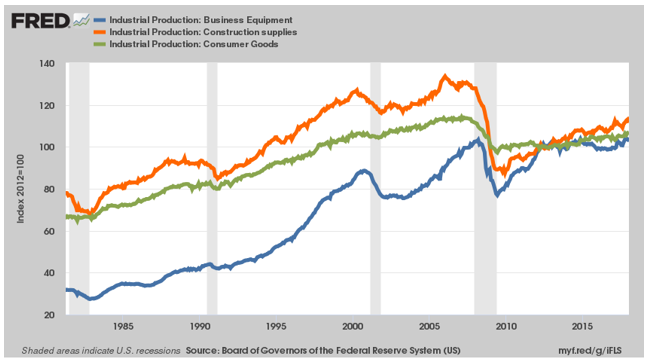 Even during the phony Greenspan housing boom, business equipment production grew at 2.3% per annum—before dropping essentially to the flatline at just o.28% per annum during the current so-called recovery. In the case of consumer goods production, the non-recovery is even more dramatic. After averaging 2.0% per year during the three cycles between 1981 and 2007, US consumer goods production in January 2018 was still 4.5% below its pre-crisis peak. Likewise, output of construction supplies had grown at 2.1% annual during the 1980 cycle, at 2.4% per year during the 1990s expansion and by about 1.0% annually during the 2001-2007 cycle. By contrast, output of construction supplies in January 2018 was still 13% below its pre-crisis level. 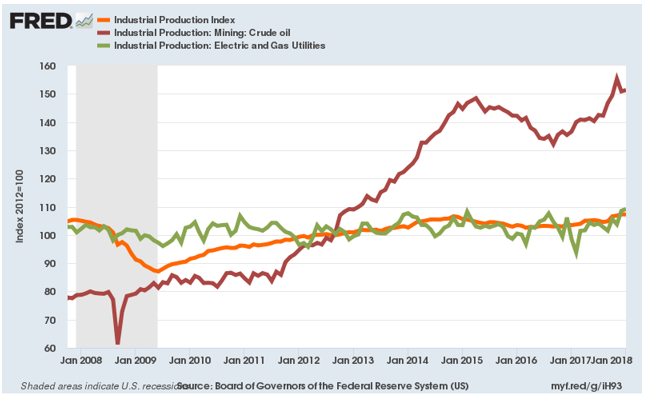 In fact, the only thing that has kept overall industrial production even on the flatline during the last 10 years is the shale patch boom and slight growth in the output of utilities. Even in the case of the gas and electric utilities, however, the annual growth path embodied in the green line below at 0.6% per annum is hardly indicative of a robust economic recovery: Surely efficiency of gas and electric use has not been improving that much in recent years—-meaning that punk growth of utilities output is just one more sign of main street stagnation. In short, we will take the unders on the proposition that shale output will continue to grow at the6.6% per annum rate recorded since the fall of 2007. Yet that is nearly the sum and substance of the current so-called recovery across the entire industrial economy. In Part 4, we will address the obvious question: Ever since the financial crisis of 2008 and the Great Recession which it triggered, the US economy has been juiced with massive government sector stimulus. To wit, $3.5 trillion of bond buying by the Fed and upwards of $10 trillion in incremental public debt. 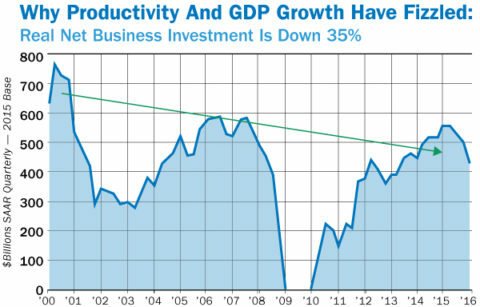 So if that didn’t boost the industrial economy in the slightest, where did it go? No spoiler alert is needed on a day in which the casino has proven once again that what happens there reflects the fermenting fruit of Bubble Finance, not the realities of the main street economy.